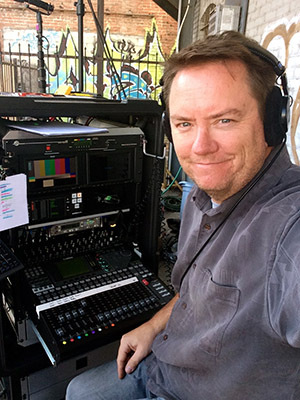 Greetings, I'm Richard Ragon, a production sound mixer (sometimes referred to as a location sound recordist) working in the Los Angeles area. I've always been fascinated by sound. I'm fascinated by how sound can be such a huge part of our lives, yet we hardly ever think about how we use it every single day. Sound is a powerful tool that can be used to tell a story, or it can be simply used to set a mood. Sound is so powerful that there is not a grocery store, retail store, or shopping center in all of America that doesn't use sound to affect your mood and alter your shopping habits while in that store. People use sound to pass the time while in their cars, or cheer them up if they've had a hard day. It knows no age limit, and crosses all boundaries. Even the absence of sound is an event in itself. The benefits of having a great sound track in a film are obvious, but few people, even in the business, know how that technically gets there. Good sound in a film will go hardly noticed, but bad sound in a film will be noticed by all. Bad sound is the mark of an amateur, and it's what separates your film from the professionals. Audiences will walk out of a film with bad sound and not be quite sure how to put their finger on what was wrong with the film. Music score, sound effects (SFX), and dialog lines make up a large majority of the sound in a film. All these sounds are collected together, and mixed near the end of the process of creating that film. A production Sound Mixer focuses mainly on getting the dialog recording of the actors, but they can may collect room tones, sound effects, or other additional sounds in an effort to help the editor and post sound mixer put it all together. In order to get good dialog recording in a film, you have to start from the beginning in the planning stages of the project. It's important that you take dialog recording into consideration when your scouting locations for filming. Not only is it preferred to collect your actors lines while on the set, but in the long run it will save you time, energy, and most importantly money. Mess this part up, and there's no going back. There's no magic bullet to fix it later, and software tools can only do so much to try to mask the unwanted parts of a bad recording. To collect the correct 'sounds' while on the set, a location sound mixer has a large arsenal of tools to do this job. In fact, it's such a huge job, small to large films require a sound crew to help him in this task. The sound department consist of two people. The sound mixer himself, and a boom operator. Larger productions might even have a third person as a sound utility person, who is basically, someone that assist moving around lots of recording equipment on a set. This site serves to showcase some of my most recent work as a location sound recorder, my referrals, my equipment, my work history, and even some of my notes and rants on the subjects of recording sound and the business of Hollywood. Over the last few years, I've had the pleasure of working for some really great directors, producers, and fellow crew members. I consider contacts that I make while working in this business to be valuable friends that I've had the great pleasure to work with on some really great projects. While these friends often come from different backgrounds, we share a common interest in the pursuit, love, and practice of filmmaking. If you dig deeper into this site, You'll find that I've provided articles written by me, my fellow sound mixers in the business, or articles that I feel explain the complicated techno jargon and help you cut to the chase when thinking about sound for your next project.